Banner for the River Run. Da Silva was addressing a crowd of over 200 at an event in downtown Toronto this Tuesday, May 31st. Earlier in the day, an article penned by David Suzuki and Faisal Moola, the David Suzuki Foundation's Director General for Ontario and Northern Canada, came out in the Toronto Star, entitled "Cleaning Up Mercury a Must in Grassy Narrows". A new petition is currently circulating from the NGO Leadnow, "CLEAN UP THE MERCURY THAT'S POISONING GRASSY NARROWS' WATER". There are over 6000 signatures on the petition at time of writing, and climbing steadily. Regional Ontario Chief Isadore Day also stands with the community, as does Amnesty International Canada. The new buzz around Grassy Narrows, the First Nation (known as Asubpeeschoseewagong in Anishishinaabemowin) located 1700km northwest of Toronto, is due to a report released Monday, May 30th. The study was initiated by the Ontario government several years ago. Costs of remediation, estimated by researchers, were pegged at $30 million to $50 million, but other estimates have been larger than $100 million. The Ontario government, which apologized for the legacy of residential schools and colonialism on Monday, has been reluctant to commit to anything. The provincial Environment Minister Glen Murray did tell the Canadian Press that, "If there's a solution there that's feasible, then we should be looking at it and acting on it." 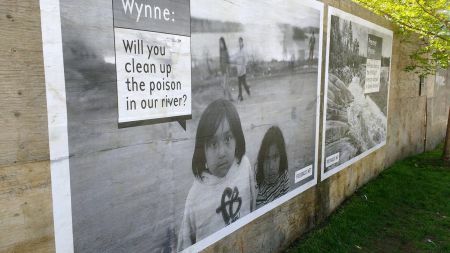 To keep the pressure on the government and further communicate the cause, a busload of Grassy Narrows community members are in Toronto and will be joined on Thursday, June 2nd, for the River Run. The River Run is a the creative march involving people and art - including thousands of meters of blue fabric and a giant fish - to create a wild river that flows through the streets of Toronto, symbolizing Grassy Narrows' wish for their river to flow with life again. The River Run rally starts at 12 noon at Queen's Park. The community and supporters hope the momentum continues after the event, and that the waters, long contaminated, can be safe again soon. The pressure is on for the Ontario government.